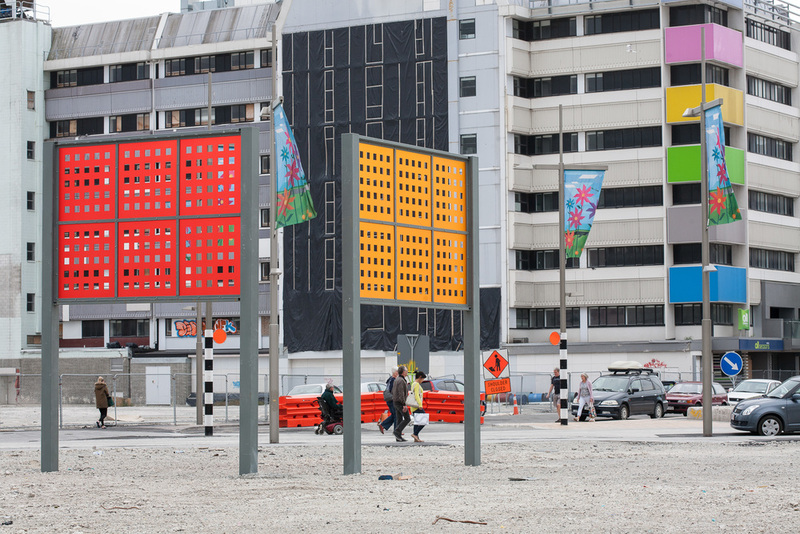 Miranda Parkes’ large billboard-like screens, located across three sites, inserted blocks of colour into the changing city environment. Seen from a distance the ‘paintings’ appear as solid colour, but as the viewer approaches they dissolve into a transparent screen, tinting the environment behind. Bridging the realms of painting and sculpture, Miranda Parkes’ works are invariably strongly coloured and responsive to their environment. She utilises brightly coloured surfaces that often reveal hidden depths, while apparently solid forms dissolve before our eyes. Parkes draws on the history of high Modernism, fusing aspects of this formal tradition with the contingent nature of contemporary urban experience. Miranda Parkes graduated with a Master of Fine Arts in painting from the University of Canterbury School of Fine Arts in 2005. Parkes had her first solo exhibition in 2003 and has since exhibited throughout New Zealand and, more recently, abroad. 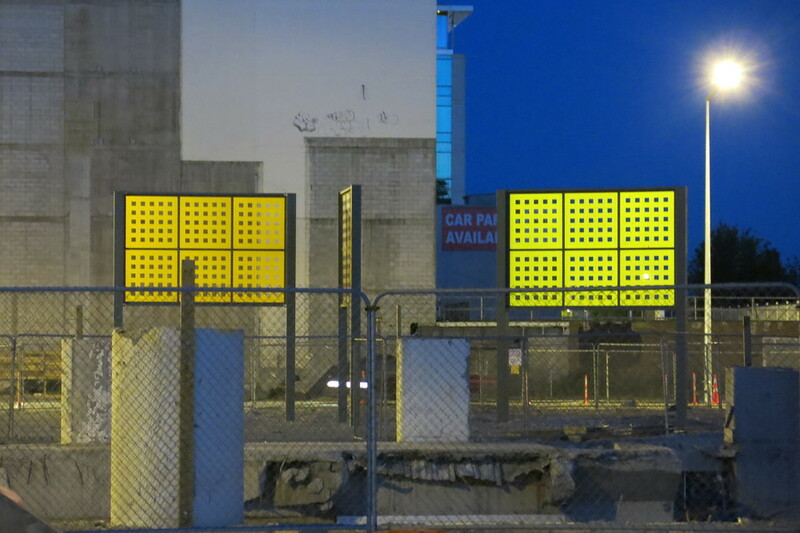 Recent solo exhibitions include: Shebang at the Sarjeant Gallery Te Whare o Rehua, Whanganui, 2013; exhibitions at Jonathan Smart Gallery and Dog Park, both Christchurch; Christchurch Art Gallery Te Puna o Waiwhetu, and at Peloton, Sydney. Parkes has shown in numerous group exhibitions, including The Artists Cinema, which screened in the 2012 New Zealand Film Festival. Parkes was artist-in-residence at Tylee Cottage, Whanganui, in 2009, and was the William Hodges Fellow in Southland in 2007. 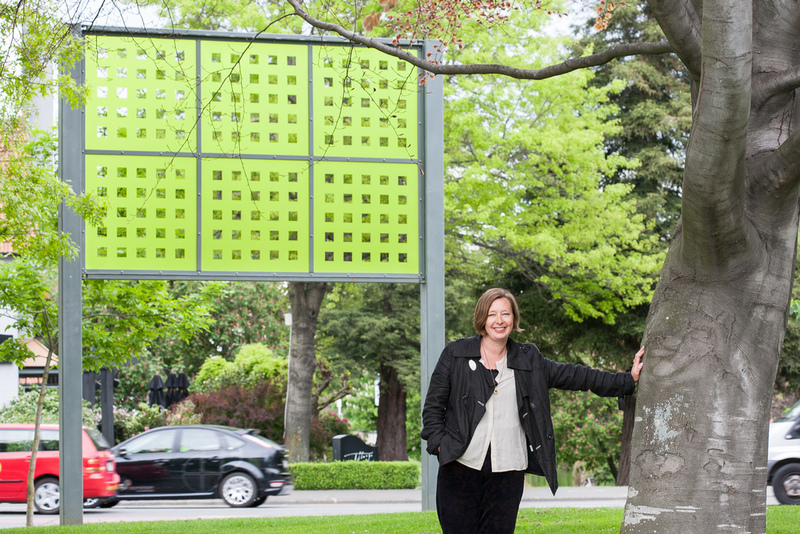 She was the 2013 recipient of the Olivia Spencer Bower Foundation Art Award, Christchurch. Miranda Parkes is represented by Jonathan Smart Gallery, Christchurch, and Antoinette Godkin Gallery, Auckland.